Star Wars Battlefront II, in development at DICE/Motive/Criterion, is certainly one of the most anticipated games due this Holiday season. Launching a month or so before Star Wars VIII: The Last Jedi, Battlefront II is poised to address several of the main issues of its predecessor. Between a brand new story campaign, improved gunplay, characters/maps/locations from all Star Wars eras and even free post-launch DLC, this sequel could be a major improvement over the original. From a technical standpoint, it’s also sure to be a looker. Powered by Frostbite, it already shows impressive visuals even in its current Pre-Alpha stage. At Gamescom 2017, Digital Foundry’s Richard Leadbetter had the chance to play Battlefront II running on PlayStation 4 Pro. He analyzed the Starfighter Assault space combat mode and found out that the game was being rendered at 1080P on Sony’s enhanced PS4 console. Most of the time it also managed to keep 60 frames per second, with the notable exception of a drop to 50FPS upon entering the map’s huge space station. This is somewhat disappointing once you consider that Battlefield 1, which has a higher player count than Battlefront II, can reach up to 1600P via checkerboard rendering on the PlayStation 4 Pro. Then again, this is still Pre-Alpha code and for all we know, the final build could reach a higher resolution target than 1080P. It will be interesting to see how the PlayStation 4 Pro version eventually stacks up against the Xbox One X, and whether the game on PC will have higher system requirements than Battlefield 1. Star Wars Battlefront II launches on PC, PlayStation 4 and Xbox One on November 17th. Check out below an official overview of the gameplay improvements planned for the Starfighter Assault mode showcased at Gamescom 2017. Developer Criterion, with over a decade of experience on racing games, joined with DICE to improve the feel of vehicles in Star Wars Battlefront II – and that includes the many starfighters featured in the game. The refined control scheme is responsive and intuitive, allowing players to quickly discover the extraordinary array of maneuvers available. Starfighters are able to weave through the orbital station’s superstructure in hot pursuit and turn on a dime to avoid torpedoes. Not all starfighters are created equal. Whether you’re playing as part of the Rebel Alliance, the Separatists, or the First Order, you’ll always have three distinct classes of stafighters to choose from. Use speedy but fragile interceptors, maneuverable and heavily armed fighters, and slow but tough bombers in complimentary roles. Using Battle Points earned in space combat, you’ll gain opportunities to pilot special hero ships in combat like Han Solo’s Millennium Falcon, Darth Maul’s Scimitar, Poe Dameron’s Black T-70 X-wing, and more. These ships are tough, powerful, and use unique configurations of special abilities to gain an extra edge in dogfights. Using Star Cards, you’ll be able to modify the abilities of any starfighter or hero ship. As you continue to earn more Star Cards, you’ll open up new ways to fine-tune your favorite vehicles. 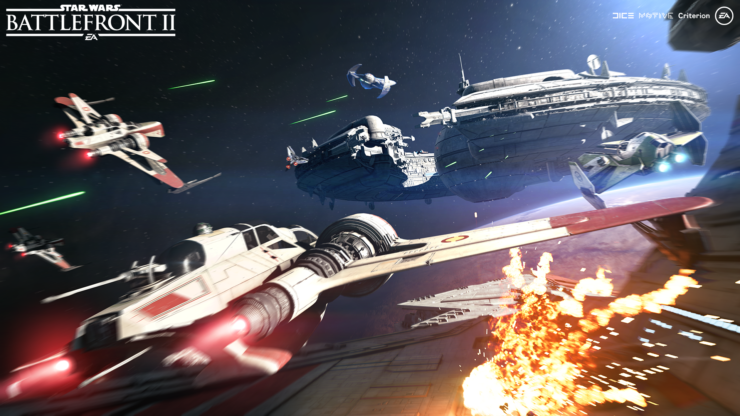 The two squadrons of opposing player-controlled fighters at the heart of the game’s Starfighter Assault are only one part of the story. When players went hands-on with the Fondor: Imperial Shipyard map, they encountered flights of AI-controlled bombers and TIE Fighters, powerful capital ships, stationary turret platforms, and a massive MC80 Liberty type Star Cruiser. The crisscrossing fire, the glow of the planet in the distance, the thundering scream of passing starfighters, and the ever-increasing stakes combined to create an experience that felt in place among Star Wars’ most iconic moments. Come November, you’ll be playing Starfighter Assaults from all three cinematic eras.